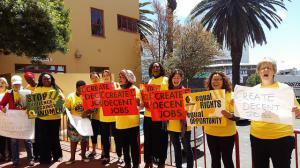 Cape Town, South Africa – Over 200 advocates for the rights of domestic workers will gather in Cape Town on the 16th to 19th of this month, as the International Domestic Workers Federation (IDWF) celebrates its five year anniversary by convening its second Congress. Representatives from IDWF’s 69 affiliated organizations from 55 different countries will come together to discuss the challenges facing domestic workers globally and consult on strategies and solutions, hoping to take inspiration from the achievements of the host country in ridding itself of apartheid and its fight for freedom of its oppressed. There are more than 67 million domestic workers worldwide: cleaners, cooks, caregivers for children, the elderly, and the disabled, as well as others employed in homes. This number is growing rapidly to meet the global ‘care gap’, as need for care givers increases with fewer family members able to stay at home and forego employment, combined with longer life expectancies for the infirm and elderly. Yet, domestic work is routinely undervalued and most domestic workers do not have the same labour protections as other workers. Throughout the world, groups of domestic workers are standing up to discrimination, rallying for laws that protect both the labour and human rights of domestic workers. At the International Labour Conference in 2011, domestic worker organizations mobilized as a global united force to achieve an international convention to protect their rights – the C189 on Decent Work for Domestic Workers. Following that achievement, and to push for global ratification of C189, the IDWF was formed at its founding Congress in Montevideo, Uruguay in 2013. Five years later, IDWF has successfully achieved projects that further its goals throughout the world, championing domestic workers, developing the capacity of fledgling affiliates, advocating for countries to ratify C189, and campaigning for local laws that protect domestic workers. 4. Strategizing to achieve a new international law to address gender-based violence against domestic workers. Furthermore, the representatives at the Congress will vote on a new 13-member Executive Committee as well as several proposed changes to the constitution. Guest speakers will come from the Labour Ministry of South Africa, the global organizations of International Union of Food Workers Associations (IUF), International Labour Organization (ILO) and Women In the Informal Employment – Globalizing and Organizing (WIEGO), as well as from local organizations, including the Congress of South African Trade Unions (CONSATU) and the South African Domestic Workers’ Union (SADSAWU). 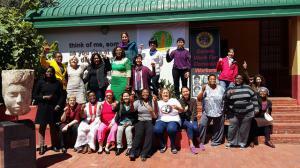 The 2nd Congress of the International Domestic Workers Federation (IDWF) will take place Nov 16 to 19 in Cape Town, South Africa. For more information, please visit www.idwfed.org or contact Ms Adriana Ramirez at adriana.paz@idwfed.org or Ms Myrtle Witbooi at myrtlewitbooi@gmail.com.